Get the Emperor's Letter for Mynisera. Talk to Mynisera at Castle Daggerfall and receive a letter from her. Give this letter to Gortwog at his stronghold in Orsinium. 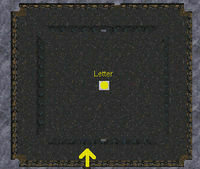 Find the emperor's letter in Gortwog's Fortress. Return the emperor's letter to Mynisera. "So Morgiah says Gortwog has the emperor's letter. Very interesting. I think I have a way to get Gortwog to turn over that letter. Are you willing to brave the depths of Orsinium to try to retrieve it?" "Gortwog wants very badly to be recognized by the empire. It would mean the beginning of peace between the orcs and the other races of the empire. Present this letter to Gortwog. Hopefully it will persuade him to cooperate." Uriel Septim, I need to reclaim this note. "So, Mynisera seeks to sweet talk me. Bah! Her letter is of no value to me anymore. She may have it. However, my people may not be so lenient toward a (player's race) wandering the halls of Orsinium. If you can survive my realm and find the letter, you make [sic] take it back to her. I will also consider you to be a worthy (player's race)." While Gortwog 'allows' you to fight your way through Orsinium to find the letter, it will not be an easy task. Be prepared before venturing onward. Upon entering the stronghold, you find yourself in the main hall, together with Gortwog and three orcs. The warlord will not attack you unless provoked, but the soldier will attack you as soon as he detects you. 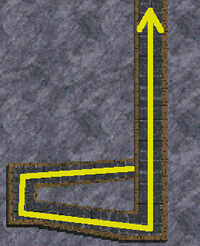 Go past Gortwog and through the left door at the back of the great hall. Once you open the door the orc shaman will attack you. Follow the hallway up and go through the door. Beware of the various orc warriors and shamans you will encounter along your way. In the bowels of the stronghold you may even encounter some Daedroths. Follow the hallway further upwards. Follow the hallway until you come to an intersection, from there go south. Follow the hallway until you come to a sort of dining-room. Leave the room through the west door. Go down the hallway and through the door. Walk down the hallway until you come to a door. Go through it and you will find yourself in a huge chamber with a hollow truncated pyramid. To proceed further, you must reach the level above the truncated pyramid. 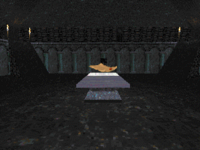 If you cannot levitate to the level above by yourself, jump into the fountain in the northeast corner of the chamber, it will teleport you to the platform right above the pyramid. Alternatively, you can take the staircase behind the south door, which will also lead to the upper level. From the platform go up the west staircase and head south past an intersection until you come to a second intersection and a door. The door will be locked, so open it with either lockpicks, magic or your weapon. Once the door is open, go through it. 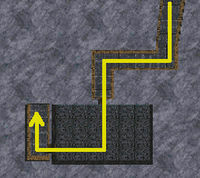 Follow this hallway past an intersection, then head south, past a secret door and go through the door at the end of the hallway. 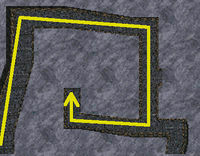 Follow the hallway further south, walk through a short cavern passage and head east. 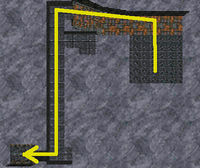 Follow the hallway once again through a short cavern passage, head west than turn north. Go through the door at the end of the hallway. 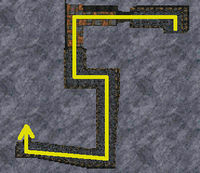 Walk downwards the hallway and south past an intersection until you reach a second intersection. Head west at this junction and follow the hallway north. Head west through the door and the textures of the environment will change. Head south at the intersection and follow the hallway until you reach a door, go through that door. Finally you have found the room where the emperor's letter is hidden. It will be on the pedestal in the middle of the pit. 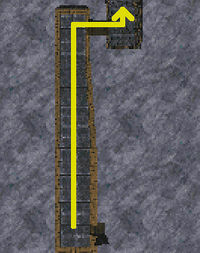 There is a ramp in the northwest corner leading down. When you approach the pedestal, four orc soldiers will come out from the north and the south door, so be prepared for them. Pick up the letter and bring it back to Mynisera at Castle Daggerfall. "(Player's first name), this letter is dangerous. Gortwog had undoubtedly sold copies of it to everyone from Wayrest to the Underking. After all, if the powers of the Iliac Bay become embroiled in war over the Totem, he stands to gain quite a lot. Go now. You have done your job. I am sure the Totem will find its way into your life somehow. You seem to have a knack for such things. Just remember, the only safe master of the Totem is the emperor." Beware, if you entered the room to speak to Mynisera the guards will attack you until you exit the castle. If you bring the letter back to Mynisera, you will gain reputation according to the table below. The Daggerfall Chronicles refers to this quest as "Orcish Emancipation". use it on my behalf. 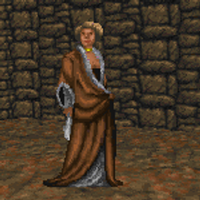 0 (Date): Mynisera, Queen Mother to King Gothryd of Daggerfall, has asked me to retrieve the stolen letter sent to her by the emperor. I have to go to the hall of Orsinium in Orsinium and give Gortwog, the orc warlord, a letter from her. This page was last modified on 24 August 2018, at 05:12.